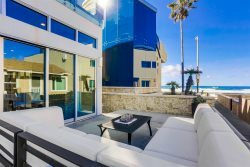 Pacific Beach is centrally located right between Mission Beach and La Jolla, and only 20 minutes downtown San Diego and the airport. Visitors to Pacific Beach will discover why it is known for great surfing and swimming, a boardwalk to stroll or bike along the ocean and a wide selection of surf shops, juice bars, nightlife, dining and boutique shopping. Bluewater has a great selection of Pacific Beach vacation rentals on and close to the ocean and Mission Bay so after you've browsed our selection, call us today to see if we have the perfect vacation rental for you!